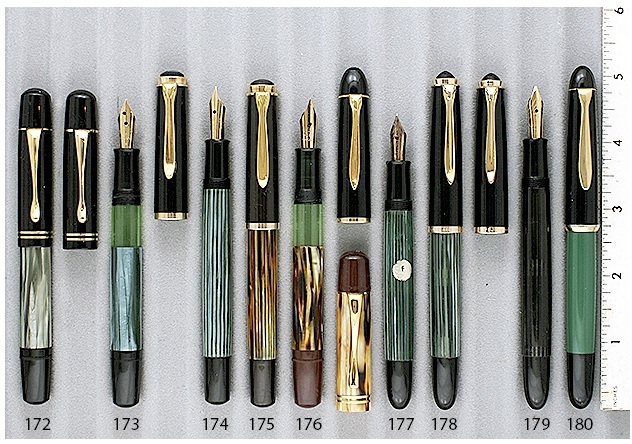 A stunning line up of Pelikans – many with flexible nibs. If you’re searching for a nib that will offer some line variation, look no further. Catalog #75 has a few Pelikans you may want to look at. #172 is sold: a 1948 100N in the rare Grey Pearl. This pen had a broad, italic, extra-flexible nib. A marvelous nib! #173: a 1950 100N in Green Pearl. This is a NOS, mint condition Pelikan with two available: one pen with a medium/broad oblique, extra-flexible, and one pen with a fine, flexible nib. $325. #174: 1950 400 in Green Stripe, near mint. There are four pens available: two fine, flexible nibs, one medium, flexible nib, and one broad nib. If you’re looking for flex, try out the fine or medium flex. Only $200. #175: Pelikan 1950 400 in Brown Stripe. A beautiful finish, near mint or better. One medium flexible nib available for only $250. #176: 1953 101N in Tortoise, an absolutely gorgeous piece, with a matching cap and red turning knob and inner cap, and a green acrylic barrel window. One fine, extra-flexible nib available. Extra-flexible! $1300. #178: 1956 400NN in Green Stripe. Near mint condition or better with four available, to make choosing even more difficult: one medium/broad flexible nib, one broad nib, one fine nib with a little flex, and one broad with a little flex. If you want to sample a flex nib but you’re not certain, try the fine or broad with a little flex. Only $200. Check out Catalog #75 for these pens, and more! This entry was posted in Vintage Pens and tagged Extraordinary Pens, Flex, Pelikan. Bookmark the permalink. Follow any comments here with the RSS feed for this post. Post a comment or leave a trackback: Trackback URL.